Waste management involves a large number of different stakeholders, with different fields of interest. They all play a role in shaping the system […]. In the best of cases, the citizens are considered co-responsible together with the municipality. Detailed understandings on who the stakeholders are and the responsibilities they have in the structure are important steps in order to establish an efficient and effective system. Communication transfer between the different stakeholders is of high importance in order to get a well-functioning waste management system in the cities in developing countries. 2We also draw on Wiek et al. (2011) to argue that a focus on fostering interpersonal competency between SWM stakeholders is a vital component of any ST effort. Specifically, we highlight that for cities in the global South that lack strong institutional capacities, and are characterised by inequality, considering power structures and normative frames is required to make the TM framework effective in these contexts. 3Bangalore, a city of eight million people in Southern India, offers an intriguing case study via which to analyse transition dynamics. As we show, despite the presence of several enabling factors—such as an active citizens’ movement pushing for waste segregation awareness and legislative support for sustainable SWM systems—certain technical, social and institutional structures in Bangalore have been resistant to change. In this paper we ask why. We discuss how actors in Bangalore’s SWM system are recruited from different economic, social and cultural circumstances; come to the system with different needs, priorities and constraints; and are embedded in culturally determined and power-laden social relations. We assess whether the normative frames held by different actors align with official legislation, and consider how communication techniques could foster positive change by aligning the needs and wishes of different actors with the state/national legislation to enable a transition to a sustainable SWM system in Bangalore. While the TM literature has largely ignored asymmetrical power relationships and conflict, we here pay explicit attention to the conflict and power differences that arise from different social positions and normative frames. 4The contents of this contribution were part of a larger research project assessing gaps and opportunities for Bangalore’s transition to a more sustainable SWM system (Rengarajan, 2013). Data were collected using mixed quantitative and qualitative methodologies (primary sources) and triangulated through a review of the literature as well as newspaper editorials (secondary sources). During the summer months of 2012, Biyani (née Rengarajan) spent three months in Bangalore conducting a transect study, political interviews with the municipality and an observational naturalistic inquiry through a trash trail. Information from interviews, audio and video recordings and photographs collected by Biyani were combined with a review of the literature1 to compile a list of actors and stakeholders in the Bangalore SWM system, and assess their socio-economic status, roles and responsibilities. Information on national and state legislation was obtained from Indian government web sources. Together, these data provided holistic insights into SWM issues in Bangalore. We then used these data to interpret the objectives and normative frames of the different actors in Bangalore’s SWM landscape, and to evaluate whether they matched the goals outlined in national regulations. In other words, were Bangalore’s SWM actors incentivised to help realise the ‘sustainable SWM state’ or were they in opposition to it? Finally, we draw on the literature on interpersonal competencies and stakeholder frames to develop recommendations with regard to how different communication strategies and incentive structures could be used to realign normative frames for collective action in Bangalore’s SWM transition. 5Transition management (TM) approaches are used as a tool for strategic planning in order to facilitate sustainability transitions (Kemp, 2000; Loorbach and Rotmans, 2006; Loorbach, 2007). TM offers a multi-level decision-making model particularly suited to managing change in complex systems (Kemp et al., 2007). Based primarily on the Dutch government’s efforts to move towards more sustainable energy, waste, water, and housing policies, the TM framework emphasises policy design based on reflexive governance concepts and is concerned with the explicit (rather than implicit) aim of redirecting and accelerating transitions. TM asserts that transitions are often the result of external forces and crisis—and that crisis can be viewed as an opportunity to accelerate reorganisation towards more sustainable goals. While these features make the transition management framework particularly powerful for planning and evaluating movement towards sustainability, the framework does little to account for the vested interests and the diverse views and agendas of the actors within a complex system. TM also largely discounts the severity of the often acrimonious and rancorous nature of stakeholder engagement and participatory governance. The communicative processes of deliberation, probing and learning have been largely left unexamined in the TM literature. 6Some of this inattention to communicative processes could be attributed to the provenance of the TM framework. The empirical research underlying TM rests largely on a Eurocentric perspective, particularly one from the Netherlands. Successful transitions documented in the Netherlands could be partially attributed to high literacy rates, the absence of an informal sector, strong institutions and a relatively egalitarian cultural foundation, which reduces the degree of fragmentation and normative conflicts within stakeholder engagements. The reflexive component of dealing with the ‘diversity of participants, different normative interests and ambitions, different sources of knowledge’ (Loorbach, 2007, 40) and the ‘normative dissent between stakeholders’ (Loorbach, 2007, 96) can have different expressions in different cultural settings and countries. The ease of role changes that TM implies, and ‘co-construction as a reiterative process through which actors deliberate and design approaches’ (Loorbach, 2007, 96), are largely oversimplified in the TM literature. This makes this framework less applicable to developing country contexts, where weak institutions, culturally embedded hierarchies and a sizable informal sector complicate stakeholder engagement. 7Formal municipal SWM systems in developing countries are constrained by factors such as limited financial resources and poor governance, thus making it increasingly difficult to change dependence on unsustainable technologies. Most cities in the global South are faced with entrenched SWM problems2 that are often at the centre of discussions on urban liveability and sustainability. This description is also applicable to the city of Bangalore. Situated in Southern India—and the capital of the state of Karnataka—Bangalore is known for its high-tech industry, earning it the title of ‘the Silicon Valley of India’. The city, spanning an area of 800 square kilometres, has a multi-billion-dollar economy thanks to its thriving information technology, biotechnology and manufacturing industries. Some consider Bangalore’s garbage crisis to have grown directly out of its success. 8From June to November 2012, the city of Bangalore experienced what became known as a ‘garbage crisis’. The death of five villagers near a massive landfill (Mavallipura) bordering the outskirts of the city made headlines and prompted inquires. The deaths were attributed to toxic leachate contamination and asphyxiation due to landfill gas. It was found that this landfill, operated by a private contractor, was in gross violation of the Environment Protection Act (EPA) of 1986 and the national waste regulations for sanitary landfills (Saldanha et al., 2012). Thus, the Karnataka Pollution Control Board, the authority responsible for monitoring waste management facilities in Bangalore, took the unprecedented decision of shutting down the Mavallipura landfill (Saldanha et al., 2012). 9The decision came as a ‘major relief’ for the twelve villages surrounding the landfill; villages whose inhabitants had been suffering the consequences of the unregulated dump for close to a decade. About one third of Bangalore’s estimated 4,000‒5,000 tons/day of waste had been being dumped in the Mavallipura landfill since 2007. The 48 acres around the landfill/dump site were still used as cattle grazing pastures by villagers, with grave consequences (ESG, 2012; Iyer, 2012). Due to the unavailability of other waste disposal sites at such short notice, the deadline for the closure of the landfill/dump was extended (Iyer, 2012; Rai, 2012). Protests erupted from the surrounding villages and some created blockades to stop trucks transporting the city’s waste from entering the landfill/dump. Strikes by the city’s sanitation workers ensued, as they demanded back pay and better working conditions. Garbage in many parts of the city remained uncollected for several weeks, and compounded by monsoon showers this heightened the threat of disease, which culminated in what became known as the garbage crisis of 2012. 10Around this time, public interest litigations (PILs) were filed in the High Court of Karnataka by the Environmental Support Group, the Solid Waste Management Roundtable, and four Bangalore citizens (see Lutringer and Randeria, 2017, this issue). The PILs challenged the decision to reauthorize an extension to the shutdown of the city’s overflowing landfills. In addition, they also sought orders to enforce progressive/sustainable ways to manage Bangalore's garbage, based on a model of decentralised processing and segregation at source (Saldanha et al., 2012). In an unprecedented decision, the High Court ‘handed down a highly progressive judgment’ that all municipal waste in Bangalore was to be segregated at source at the household level and that segregated waste should be transported to composting and recycling units for processing (Shankar, 2012; The Hindu, 2012). The verdict stipulated that ‘no mixing whatsoever should take place in the trucks (as is/was presently the case)’. The court also directed that ‘every ward is to have at least three segregation and wet waste processing stations’ (ESG, 2012). 11While the goals of these decisions were commendable, the reality of the situation was far more formidable. Whereas some parties stood to gain from the change, others stood to lose, and powerful actors in the latter category were invested in maintaining the status quo. Further, the pre-existing SWM ‘system’ did not have the capacity to implement many of the stipulations: there was no infrastructure or equipment in place to sort and transport the segregated waste. Moreover, there were no efforts made to democratise decision-making in SWM governance, and conflicts emerged around questions such as who ‘owned’ the collected waste, and to whom it would be sold and at what price. Due to these challenges, the system’s transition stalled even before it started in earnest. Thus, despite the fact that the SWM crisis provided a window of opportunity for transition and transformation, the municipality has yet to successfully implement these rules. 3 Almitra Patel vs. Union of India. Writ Petition Number 888 of 1996. 12 Solid waste management in Indian cities is, in theory, governed by municipal solid waste (MSW) rules, which were initially issued in 2000 and revised in 2013. The ‘MSW Rules 2000’ were issued in response to a PIL filed in the Supreme Court of India.3 Framed by a committee composed of solid waste ‘experts’ and in consultation with the World Bank, the MSW Rules 2000 apply to cities with a population of 100,000 and above, and outline procedures for trash collection, the segregation of waste into different processing categories, transportation, processing and the scientific disposal of waste—but thus far none of the states have implemented them (Esakku et al., 2007).4 A main point of criticism is that the MSW Rules 2000 were not conceived of in a participatory manner, a central aspect of TM’s reflexive governance ideology, but were filed in response to elite and middle-class concerns around public health and aesthetics. The framing of SWM rules was largely restricted to elite participatory forums. Several scholars have critically analysed the impact the rules had on waste workers’ livelihoods, showing how the MSW Rules 2000 prompted further privatisation of SWM services and pay cuts for contract workers (Bhan, 2009; Narayanareddy, 2011). Thus, while the rules emphasise environmental health and sustainability (BBMP, 2003; India, 2000, 2009), they further undermined the rights and needs of workers both in the formal and informal sectors. 13In contravention of the MSW Rules 2000, the contamination of soil, air and groundwater caused by the open dumping of garbage is still pervasive in Indian cities. State attempts to mandate the regulations have been largely unsuccessful. The MSW Rules 2000 were supposed to have been fully implemented by the year 2002, but not a single state has achieved full adherence this far (CPCB, 2013; Kumar et al., 2009). This failure to deliver prompted the Ministry of Environment and Forestry to revise the rules to include measures around energy recovery from waste and more participation from previously marginalised populations such as the informal sector. 173. To decrease street littering and waste. 18Achieving the goals of this legislation should be in the interests of the Government of India as well as of the State Government of Bangalore, because doing so represents a more sustainable state of SWM, which includes higher recycling rates, low landfill rates and the reduction of environmental health risks to stakeholders. But while the MSW Rules 2000 outline clear procedures, they do not outline a pathway for transition. Cities like Bangalore have made stopgap progress in implementing parts of the rules by privatising waste collection, but this has failed to add up to a system transition (Rao, 2013). While some bottom-up initiatives have enjoyed partial success, top-down legislative efforts fail to take into consideration the normative frameworks that govern the different actors in the SWM sector, thus contributing to the entrenched, unsustainable status quo. 19Several studies suggest that facilitating stronger participatory governance, more stakeholder engagement and better strategic partnerships can produce better SWM services and outcomes (Coad, 2005; Cointreau-Levine, 1994; Zurbrügg et al., 2004). Stakeholder participation has been credited with decreasing the costs and environmental impacts of SWM in Brazil, India and Africa, and has increased the longevity of SWM projects when compared to government efforts alone (Bhuiyan, 2010; Cavé, 2014; Colon and Fawcett, 2006; Gerdes and Gunsilius, 2010). Stakeholder participation and reflexive participatory governance are also emphasised in the TM framework (Loorbach, 2007). However, while the TM literature acknowledges the importance of stakeholder engagement and participatory methods in terms of engendering transformations, it fails to truly examine the underlying complexity involved in actors’ transitions to new roles—especially when such complexity is culturally embedded and historically contingent—ignoring conflict, asymmetrical power relations and the broader political context (Voß and Bornemann, 2011). In Bangalore, it is evident that the effective management of segregated waste will require stakeholder participation. Critically, many SWM actors will have to change their practices and business models, sometimes in ways that might be detrimental to their self-interest in the short term. Because of this, some powerful actors could have a vested interest in thwarting a transition. In such a context, the TM framework needs to have the tools to understand the frames and motivations of such actors and to develop safeguards against its capture by powerful interests. It also needs to acknowledge and harness conflict to create effective partnerships for change. However, nurturing partnerships that include diverse actors with different normative frames is no simple or automatic task. As Wiek et al. (2011) argue, interpersonal communication, one of the five key competencies required for sustainability problem solving, plays a key role in facilitating collaboration. One mechanism of reconciling normative frames is through the explicit use of interpersonal communication tools. 20In the next sections of this paper, we take a detailed look at the diversity of actors in the SWM system and at their normative frames. We attempt to understand the world views of different actors, the processes through which they are incentivised, and how this affects the potential for a system transition to take place. Following this, we ask: how can insights from the interpersonal competency literature be used to facilitate transitions in Bangalore’s SWM sector? We focus on specific communication tools—framing and persuasion, facilitation, narratives and counter-narratives, consensus building, conflict management and boundary work—to demonstrate how they could be deployed to facilitate frame alignment and consequently a system transition in Bangalore. 21In Bangalore today, we are witnessing how transitions to sustainable waste management systems are facilitated or thwarted. On the one hand, the city now has formal rules and codes supporting at-source segregation, decentralised recycling, and composting. These rules have been framed at the behest of an activist High Court bench, with the municipality and state government following along by amending the Karnataka Municipal Corporation Act, albeit with some reluctance. Legislative and administrative initiatives are anchored in and held accountable by a substantial middle-class and elite population of waste management practitioners and advocates, whose ‘networked ecological citizenship’ activities have served to popularise sustainable waste management concepts and practices in the city (Anantharaman, 2014). This middle-class support is complemented by support from NGOs and groups working with informal sector waste workers, many of whom provide sustainable waste management services. The rules have also been designed to respond to key changes in waste streams, such as the relative increase in ‘dry waste’, and changes in living arrangements, such as an increased abundance of large apartment complexes and gated communities. For example, new apartment complexes that have over 50 units are required to have in-house composting or biogas systems to process organic waste. Other areas have set up community composting initiatives in neighbourhood parks. New infrastructure targeted at processing organic or wet waste is complemented by efforts at creating new supply chains to collect, sort and divert dry waste and recyclables. Despite all this momentum working in favour of a sustainable SWM system, the transition has remained largely stalled, stuck in the status quo. Understanding why requires us to map all the different actors involved in governing Bangalore’s SWM systems. 22 While the national government formulates rules – i.e. the MSW Rules (2000), the state government determines the execution of the municipal SWM rules, and the city municipality, the Bruhat Bangalore Mahanagara Palike (BBMP) is ultimately responsible for implementing SWM rules. Additionally, the Karnataka Pollution Control Board (KSPCB, an autonomous environmental regulator) is responsible for SWM law enforcement. Public sector actors are challenged in multiple ways. First, the BBMP is grossly underfunded and SWM is one of many areas (in addition to water, zoning, building, etc.) fighting for its financial resources. Often, typically only 5–25 per cent of the total budget granted to the municipality is spent on SWM. In turn, over 80 per cent of the SWM budget is spent on paying the private sector for the collection and transport of mixed waste and about 5 per cent of the budget is spent on waste disposal (Visvanathan and Tränkler, 2003, 54). Additionally, the public sector does not have the necessary resources to ensure compliance with the regulations. Consequently, it is not able to fulfil its roles and responsibilities effectively, a problem that plagues many developing countries (Cointreau-Levine, 1994). 23The BBMP is responsible for forging transparent contracts with private contractors, for waste collection, recycling, transportation and disposal. Although national and state legislation promotes recycling in theory, the focus is largely on transporting copious amounts of mixed waste from the city to various dumps in the periphery. To date there are no contracts for non-organic recycling, a main point in the MSW Rules 2000. While resource efficiency efforts are emphasised in SWM legislation, contradictions over whether to encourage informal sector recycling (though it is technically illegal) or to discourage informal recycling (thus discouraging resource efficiency) plague the municipality. While the BBMP is incentivised to transition by potential cost savings, reducing SWM costs may not be in the interest of individual government functionaries. Some public sector actors may have a vested interest in maintaining the status quo (bribes or family connections), impeding transition efforts. For all these reasons, while public sector actors represent the interests of national legislation on paper, and even though they have substantial socio-economic power, they are unable to devise and execute a transition pathway. 24 Locally called pourakarmikas, waste collectors collect household waste in designated city areas. These waste collection services have been privatised in recent decades, and the private sector is responsible for 91 per cent of SWM collection activities (BBMP, 2008; 2012). In the remaining wards (8 per cent) only collection services are managed by the BBMP, while transport and disposal remain in private hands. A transect study (Rengarajan, 2013) revealed that waste collection was not clearly organised, a finding echoed by other studies (Beukering et al., 1999; Joseph, 2002). Machinery like compactor trucks, tipper trucks and mechanical sweepers are owned solely by the private sector, but are not suitable for the high moisture waste produced in cities like Bangalore due to the relatively low amounts of paper, plastic and other ‘dry wastes’ in municipal waste streams (though this trend is slowly changing; see Ganguly, 2017 and Karanth, 2017, this issue). 25While the BBMP employs only 4,300 workers, private contractors employ over 11,000 guttige (contract) pourakarmikas, as they are called locally (Kasturi, 2012). The majority come from the lower castes in India, may be illiterate and are highly vulnerable to exploitation by their private sector supervisors (Baud et al., 2004). 26In Baud et al.’s (2004) seminal work, interviews revealed that pourakarmikas working for the municipality felt privileged because of their better working conditions and health care and pension provisions; in contrast, the waste collectors employed by the private sector (to do the same work) are not granted these benefits. In the context of the urgent need to maintain the overall cleanliness of the city, the MSW Rules 2000 allow private sector contractors to circumvent labour laws (Narayanareddy, 2011). Workers’ job security and pay is completely at the discretion of the contractors who employ them (Murthy, 2015). Some contractors often fail to pay their workers for months on end (Krishna, 2015). To make ends meet, waste collectors extract recyclables like milk packets, glass and paper to sell to informal sector scrap dealers and recyclers for additional income (Visvanathan and Tränkler, 2003; Kasturi, 2012; Madhav, 2010). 27 As evidenced by the PILs filed in the courts, some of Bangalore’s citizenry have expressed their support for recycling and composting programmes and their willingness to comply with new source segregation directives. Since 2012, the citizen movement has gathered unprecedented momentum, with various NGOs and community-based organisations (CBOs) actively collaborating with households and apartment complexes in certain parts of the city to implement sustainable waste management processes (Hasirudala, 2012; SWMRT, 2009; Krishnan, 2014). The establishment of the Bangalore Solid Waste Management Roundtable (SWMRT) further highlights the interest and commitment of these actors, who are working to convene networks in the city that actively promote and support ecological practices. Members of SWMRT have helped apartment complexes set up recycling and composting programmes and have connected service providers to waste producers to encourage biogas generation and community composting initiatives, particularly in gated complexes (see also Lutringer and Randeria, 2017, this issue). Elite and middle-class actors are also forging connections with members of Bangalore’s informal waste sector, broadening the support base for neighbourhood recycling and composting initiatives (Anantharaman, 2015). The frames and objectives of these actors are varied—some are extremely involved in the green agenda, some are not, and some are apathetic due to the lack of awareness of these efforts. 28 Private sector actors in SWM are contractors who are responsible for collecting, transporting and disposing of waste. While private sector roles and responsibilities are purportedly to collect and transport waste as per the MSW Rules 2000, their frames and objectives are really to fulfil the terms of their contract obligations in the cheapest way possible, and thus to make as much profit as possible. Transport generates a huge financial cost for the municipality as the trucks are compensated on a per trip basis (Madhav, 2010; Ramachandra and Bachamanda, 2007). Decreasing landfill waste would mean lower profits, as contractors are compensated in proportion to the quantity of garbage transported away from the city. In the interests of profit and in the absence of regulation, private supervisors are motivated to pay their low-skilled employees low wages and do not have much incentive to promote recycling, as it might increase their labour costs and decrease their profit margins. Having built a profitable business model around the unsustainable SWM system, they are unlikely to support a transition. 29Contractors who are responsible for waste disposal have similar incentives. The Mavallipura landfill, operated privately, is said to have a capacity of 300 tons/day but currently accepts up to 1,000 tons/day. While its operators are expected to maintain the facility by collecting and treating toxic landfill leachate; ensuring that no air, water or soil contamination occurs; and minimising vermin and pests (Saldanha et al., 2012), they do not. Since there is minimal to no external monitoring by the KSPCB, landfill operators are mainly concerned with profit retention rather than with the upkeep of the site. Currently, 90‒95 per cent of MSW in Bangalore is openly dumped in unregulated and unsanitary (not properly lined to catch leachate) landfills (BBMP, 2012; Sharholy et al., 2008). Leachate infiltration causes serious air, water and soil contamination (Visvanathan and Tränkler, 2003, 74). Methane gas accounted for seven million tons of emissions in 1997, and was the primary reason for the SWM crisis in 2012—the five villagers who died suffered methane gas asphyxiation. Methane capture is still not prevalent and poses a constant explosion risk. 30Not one single incineration plant in India has remained running for more than three years after its installation (Annepu, 2012; Nandi, 2015). Two factors mask the true cost of incineration plants: first, the plants are set up on land owned by the municipality and leased for free, but while the ‘The corporation is not expected to pay for waste treatment but a tipping fee of Rs.195 [2.98 USD] per MT of rejects is agreed upon,’ (India, 2009, 43). Second, the subsidised cost of the incineration feedstock further masks the true cost of set up and operation. This payment model creates disincentives for more sustainable SWM systems. In practice, private sector waste contractors would need to completely overhaul their business models. In TM terms, it is primarily these actors who stall the transition from the old, dominant regime to a new one. 31 The final group of actors in Bangalore’s SWM system concerns the members of the waste-engaged informal sector. While collection, transportation and disposal are dominated mainly by the formal sector, recycling is carried out entirely by the informal sector. Essentially, these engaged individuals are the only actors who share the same vision, frames and objectives as the state and those expressed in national legislation. 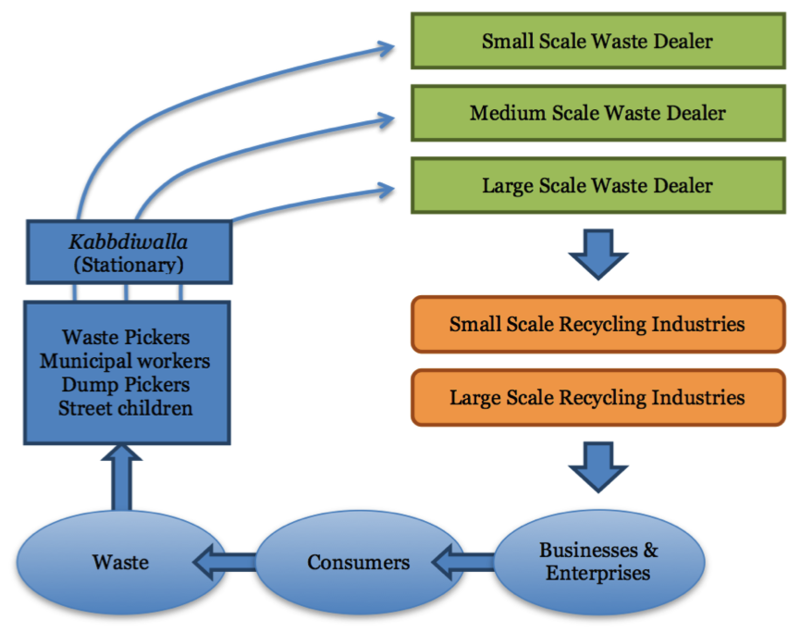 Waste pickers, municipal workers and itinerant recyclers collect from all parts of the waste stream (see Figure 1). An estimated 25,000 informal sector waste pickers in Bangalore are skilled at recognising and recovering high-value recyclables. These collectors then sell their goods to the kabbdiwalla, or scrap dealer, a middleman who aggregates and sorts valuable waste—such as newspaper, plastics and glass—in bulk. The kabbdiwalla enjoys a relatively higher income than the waste pickers, but this fluctuates with the collection rate. Scrap dealers then sell aggregated and sorted waste at a higher price further along the value chain. Recyclers located at the fringes of Bangalore (Naindahalli) have remarkable creativity and business skills. They forage for new products or sell collected material to industries for manufacturing. While ignored in legislation, informal actors play a crucial role in the success or failure of waste management systems. Resource creativity, abundant labour and poor economic conditions contribute to the widespread prevalence of informal practices in SWM (Scheinberg, 2008; 2012; Madhav, 2010). A study in India by Ali and Snel (1999) looks at the power structures and levels of influence exerted by the different actors in SWM schemes. The authors overwhelmingly find that waste pickers, municipal sweepers and informal waste collectors are the most vulnerable and require special initiatives to protect their interests. There is a distinct, culturally embedded power play involved that has repercussions on how garbage is managed; particularly in terms of the caste identities of these actors compared to the caste identities of middle-class sustainable waste management advocates. We delve more into the subtleties of this ‘power play’ and how it affects TM in the next sections of this paper. 32A number of developed countries (or individual cities) known for various degrees of achievement with regard to sustainability in waste (e.g. the Netherlands, Austria, Naples and London) have used SWM ‘crises’ as opportunities to transform. A number of pre-transition similarities are apparent between the SWM trajectories of the Netherlands and of Bangalore: uncontrolled dumping, incineration pollution, negative public opinion of landfill, etc. (Kemp, 2000). The Dutch transitioned to a system of sorting and recycling5 by creating a specially designated waste management council (AOO), which acted as a change agent and mediator. Initial reluctance to adopt at-source segregation practices were overcome due to AOO’s mediation of negotiations between the different layers of government and private waste companies and its encouraging a ‘commonly shared long-term orientation’ with less landfilling. This coordination changed the rule system, and with it, the roles of the different actors changed as well (Kemp, 2000, 6). A causality analysis disclosed that no single driver alone was responsible for the transition but that several drivers influenced each other (Kemp, 2000). Studies reviewing transitions in the Netherlands show that they occur in situations where actors with different normative frames come together to pursue one goal (Loorbach, 2010). However, while the TM literature is explicit about managing transitions, it is implicit with regard to the constraints inherent in dealing with how to create commonly shared orientation between stakeholders with divergent interests. In developing countries, culturally embedded power relations further complicate the transition arena. 33Scholars of framing and narratives agree, formal logical arguments are not always the most persuasive (Nisbet, 2009; Benford and Snow, 2000). Research shows that regulations introduced on the basis of scientific reasoning alone lack credibility with opponents who consider other framing mechanisms more valid, and that case-specific framing may help resolve policy stalemates, moving debates forward. How societies choose to frame an environmental problem has a direct impact on how the problem is then addressed (Benford and Snow, 2000; Miller, 2000). Correcting for TM’s simplified stakeholder process we focus on integrating the following pertinent communication concepts: framing and persuasion, facilitation, narratives and counter-narratives, consensus building, conflict management and boundary work. 34Framing defines the issues, shapes the actions taken and justifies the stance, and thus can be a persuasion tool with which to motivate action. Framing can also narrow or widen the discourse; impacting the questions asked, the knowledge produced, the actors empowered and ultimately the political opportunities and the decision made (Benford and Snow, 2000). Boundary workers (NGOs and CBOs) translate policy into actionable outcomes (White et al., 2008), while facilitation principles aid mediator bodies (such as the AOO in the Netherlands) to facilitate constructive discourse, as the manner employed to impart information can make or break the outcome (Nisbet, 2009, Alberts et al., 2005). Using cultural epithets and undoing negative framing, narratives can tailor messages to prevailing attitudes, values and perceptions, making complex policy debates resonate personally (Fisher, 1984; Arvai and Gregory, 2003). Conflict management involves uniting opposing views in compromise (Alberts et al., 2005). In a study of US Salmon Policy control conducted by White and Hall (2006), they describe how using multiple communication frames paved the way for a positive debate and actionable outcomes. Most importantly, stakeholder consensus depends on the ability to listen, speak the language of the audience, employ that audience’s own cultural frame of references and world views, and then leave the other with the tools necessary to understand the contestation trade-offs (Arvai and Gregory, 2003; White, 2013). It is in this arena that the government needs to find framing and incentive structures that resonate with the different actors. A new business model around the new waste legislation could possibly be developed, but the details would have to be generated by these actors themselves, in collaboration with the state, waste workers and citizens’ groups. Actors would have to have the same or more economic incentives within the new system compared to the old one to shift towards supporting the transition. If such a development is deemed unsuitable by those who represent the public interest and by waste workers, the government would need to facilitate opportunities for conversation and communication to identify alternative pathways. The communication techniques we outline in Table 1 resonate with research in which Gutierrez et al. (2011) emphasise that leadership, social capital and incentives encourage long-lasting community engagement around management of the commons. A social capital base is a network of relationships that enables society to function effectively, even in the presence of competing or opposing interests (Gutierrez et al., 2011). If we conceptualise waste as a type of commons (Gidwani and Reddy, 2011), insights from the TM literature, together with the communication and stakeholder engagement strategies we outline, make for a stronger social capital base and the elucidation of incentives that Gutierrez says is key to commons management. Table 1 summarises the transition barriers applicable to each actor category in Bangalore’s SWM system and possible strategies to overcome these barriers and facilitate transition. Each of these strategies is tagged (in parentheses) with the communication tool (framing, facilitation, consensus building, etc.) that is entailed in the use of the specific strategy. The transition barriers elucidated in the table below were overcome with the help of the AOO and mediating bodies in the case of TM for the Netherlands. National legislators have drafted SWM legislation without considering incentivisation processes and the vested interests of various actors. GAs have failed to acknowledge and include the informal sector in the decision-making process and in drafting legislation. Private sector contract specifics encourage landfilling as opposed to resource conservation. Enforceable regulations for the treatment and disposal of waste and effective monitoring and compliance mechanisms are absent. These individuals are not trained to handle segregated waste. Most city residents are not aware of the need to—or how to—segregate waste. Where there is awareness or involvement, this is largely restricted to the elite and middle-classes. Elite/middle-class initiatives are exclusive and fail to actively engage other social groups, particularly slum residents, in the dialogue. The current business model is not compatible with sustainable SWM. The current roles of collector, transporter and dumper are obsolete in a sustainable SWM system. The current infrastructure (collection fleets and vehicles) is not suitable for transporting segregated waste. Private contractors and other private sector actors will either have to find and embrace different roles, or will lose out in an SWM transition. To facilitate this adoption of different roles, other actors such as the government and WPAGs can attempt to transform entrenched power structures in non-threatening ways. (framing, consensus building, narratives). Supervisors’ current role will become obsolete in a sustainable SWM system. Fleet size may be too large if the SWM strategy switches to source segregation and recycling, as the number of trips to the landfill will be reduced. Workers currently lack the training and skills needed to handle segregated waste and pass it down the collection chain for recycling. Workers currently do not feel empowered to be confident of their authority to insist upon segregated waste from households and apartment complexes. National legislators have drafted SWM legislation without considering informal actors, who must be given a platform to voice their needs if they are to be able to support the legislative framework. Waste picker livelihood concerns, such as losing access to waste and recyclables, have largely been ignored or underplayed in the transition process. Current regulations do not enable the legitimisation and professionalisation of informal sector waste work occupations. Sources: Anantharaman (2014); Baud et al. (2004); Kasturi (2012); Rengarajan (2013). 35Moving beyond policy panaceas for socio-ecological systems is critical to implementing sustainability transitions. While Bangalore has displayed steady progress and determination in moving towards a more resource-efficient SWM system (setting up dry waste collection centres and establishing various NGOs and partners in SWM outreach), the city has reached for cure-alls—quick solutions to its waste management woes that do not deal with the complexity that the SWM sector represents: livelihood sources, social justice issues, a tragedy of the commons and, especially in India, caste and vulnerability issues. Based on the findings of this study we primarily recommend an exhaustive stakeholder engagement process in which the representation of diverse castes, economic classes and social groups is prioritised. Moreover, based on our findings we recommend the setting up of a facilitating body, whose members can competently facilitate meaningful dialogue between the various stakeholders, employing and integrating communication tools such as framing concepts, facilitation principles, boundary work, formulating narratives, conflict management, cultural theory, persuasion and influence, advocacy, and results-oriented management. Communication, facilitation and framing processes are important and often overlooked aspects of engendering effective transitions. Indeed, the role of the AOO in the Dutch waste transition was that of a facilitator, a role that Kemp recognises as paramount: ‘The AOO played an important role in the transformative process. 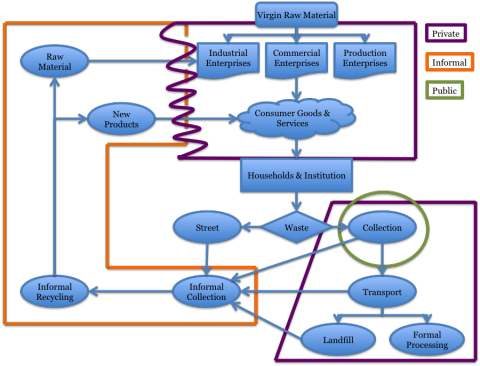 Negotiations between the different layers of government and the private waste companies took place with the AOO, the actors agreeing on the general direction [for the future]’(Kemp, 2000, 5). 36While our study looked at actors’ frames, we did not look at actors’ needs: what do the different actors require from a future SWM system that is also more sustainable? Subject to the results of the stakeholder process, which should elucidate their interests and incentives better, we recommend strategic policies that would divert waste from landfills to other productive and job-creating enterprises, while calling explicit attention to livelihood and social justice issues. It is evident that role changes will inherently carry uncertainty and risks for all actors involved. In general, the municipality could substantially decrease transportation and manpower costs—bypassing certain superfluous bureaucratic elements—if a more sustainable SWM pathway were to garner acceptance, and could change the payment model from one based on tipping fees. In addition to these policy recommendations, our paper also provides important insights for the transitions management literature. Our study highlights the need for transition management theory to explicitly consider questions of power and politics within its conceptual frameworks to mitigate unintended outcomes and consequences. Additionally, sustainability transitions should not be conceptualized as linear processes, but rather as adaptive and reiterative. Finally, transition management experiences in developing countries should be further explored and documented to extend the applicability of the framework to these contexts. Ahmed, S.A. and M. Ali (2004) 'Partnerships for solid waste management in developing countries: linking theories to realities', Habitat International, 28(3), pp. 467–479, DOI: 10.1016/S0197-3975(03)00044-4. Alberts, J.K., B.L. Heisterkamp and R.M. McPhee (2005) 'Disputant Perceptions of and Satisfaction With a Community Mediation Program', International Journal of Conflict Management, 16(3), pp. 218–244, DOI: 10.1108/eb022930. Ali, M. and M. Snel (1999) 'Lessons from community-based initiatives in solid waste', Water and Environmental Health at London and Loughborough (WELL), Study 99 (London School of Hygiene & Tropical Medicine: Loughborough University), http://www.ircwash.org/​sites/​default/​files/​Ali-1999-Lessons.pdf (accessed on 27 April 2017). Anatharaman, M. (2015) ' Middle Class Waste, Working Hands: The Politics of cleaning and greening the Garden City', South Asia by the Bay, http://southasia.berkeley.edu/​sites/​default/​files/​shared/​events/​SATB_2015/​Abstracts/​Anantharaman_SATB_2015.docx (accessed on 1 November 2015). Anantharaman, M. (2014) 'Networked ecological citizenship, the new middle classes and the provisioning of sustainable waste management in Bangalore, India', Journal of Cleaner Production 63, pp. 173–183, DOI: 10.1016/j.jclepro.2013.08.041. Annepu, R.K. (2012) Sustainable solid waste management in India (New York: Columbia University), Master’s Thesis. Arvai, J. and R. Gregory (2003) 'Testing Alternative Decision Approaches for Identifying Cleanup Priorities at Contaminated Sites', Environmental Science & Technology, 37(8), pp. 1469–1476, DOI: 10.1021/es020762p. Baud, I. and J. Post (2003) 'Between market and partnerships: Urban Solid Waste Management and contributions to sustainable development', Global Built Environment Review1, 3(1), pp. 46–65, http://www.globalbuiltenvironmentreview.co.uk/​Documents/​3.1%20Article%204.pdf (accessed on 24 October 2015). Baud, I., J. Post and C. Furedy (2004) Solid Waste Management and Recycling: Actors, Partnerships and Policies in Hyderabad, India and Nairobi, Kenya (Dordrecht: Springer Netherlands). BBMP (Bruhat Bangalore Mahanagara Palike) (2012) 'Solid Waste Management in Bruhat Bangalore Mahanagara Palike', Garbage Crisis: Note for Segregation, 2012. BBMP (2008) 'Solid Waste Management in Bruhat Bangalore Mahanagara Palike'. BBMP (2003) 'Solid Waste Management in Bruhat Bangalore Mahanagara Palike'. Benford, R. and D. Snow (2000) 'Framing Processes and Social Movements: An Overview and Assessment', Annual Review of Sociology, 26, pp. 611-639 http://www.jstor.org/​stable/​10.2307/​223459 (accessed on 27 April 2017). Beukering, P. van, M. Sekher, R. Gerlagh and V. Kumar (1999) Analysing Urban Solid waste in Developing Countries: a perspective on Bangalore, India, Working Paper 24 (London: IIED), http://www.prem-online.org/​archive/​17/​doc/​creed24e.pdf (accessed on 27 April 2017). Bhan, G. (2009) '"This is no longer the city I once knew". Evictions, the urban poor and the right to the city in millennial Delhi', Environment and Urbanization, 21(1), pp. 127–142, DOI: 10.1177/0956247809103009. Bhuiyan, S.H. (2010) 'A crisis in governance: Urban solid waste management in Bangladesh', Habitat International, 34(1), pp. 125–133, DOI: 10.1016/j.habitatint.2009.08.002. Boyer, B.B. and J.W. Cook (2010) Case Study: Thinking Big By Starting Small. Designing pathways to successful waste management in India and beyond (Helsinki: Helsinki Design Lab). Cavé, J. (2014) 'Who owns urban waste? Appropriation conflicts in emerging countries', Waste Management & Research: The Journal of the International Solid Wastes and Public Cleansing Association, 32(9), pp. 813–821, DOI: 10.1177/0734242X14540978. CPCB (Central Pollution Control Board) (2013) Status Report on Municipal Solid Waste Management (New Delhi: Ministry of Environment and Forests). CPCB (2012) Status Report on Municipal Solid Waste Management (New Delhi: Ministry of Environment and Forests). Coad, A. (2005) Private Sector Involvement in Solid Waste Management, Avoiding Problems and Building on Successes, CWG Publication Series 2 (Collaborative Working Group on Solid Waste: St. Gallen) https://www.giz.de/​fachexpertise/​downloads/​en-private-sector-waste-management-summary2005.pdf (accessed on 1 December 2015). Cointreau-Levine, S. (1994) Private sector participation in municipal solid waste services in developing countries, Urban Management Program Discussion Paper (Washington D.C.: World Bank) http://documents.worldbank.org/​curated/​en/​325321468739287095/​pdf/​multi-page.pdf (accessed in February 2013). Colon, M. and B. Fawcett (2006) 'Community-based household waste management: Lessons learnt from EXNORA’s “zero waste management” scheme in two South Indian cities', Habitat International, 30(4), pp. 916–931, DOI: 10.1016/j.habitatint.2005.04.006. Esakku, S., A. Swaminathan, O. Parthiba Karhtikeyan, J. Kurain and K. Palanivelu (2007) 'Municipal solid waste management in Chennai city, India', Proceedings Sardinia. ESG (Environmental Support Group) (2012) Karnataka High Court Directs Bangalore to be the First City in India to Segregate Waste at Source (Bangalore: Environmental Support Group) http://www.esgindia.org/​education/​teaching-resources/​press/​karnataka-high-court-directs-bangalore-b.html (accessed on 27 April 2017). Fisher, W.R. (1984) 'Narration as a human communication paradigm: The case of public moral argument', Communications Monographs, 51(1), pp. 1-22, DOI: 10.1080/03637758409390180. Ganguly, S. (2017) ‘Making Sustainability Palatable? Changing Practices of Middle Class Food Consumption in Bangalore’, International Development Policy, 8.2, DOI : 10.4000/poldev.2478. Gerdes, P. and E. Gunsilius (2010) 'The Waste Experts: Enabling Conditions for Informal Sector Integration in Solid Waste Management. Lessons learned from Brazil, Egypt and India' (Eschborn: GTZ), https://www.giz.de/​en/​downloads/​gtz2010-waste-experts-conditions-is-integration.pdf (accessed on 27 April 2017). Gidwani, V. and R.N. Reddy (2011) 'The afterlives of “waste”: Notes from India for a minor history of capitalist surplus', Antipode, 43(5), pp. 1625-1658, DOI: 10.1111/j.1467-8330.2011.00902.x. Guerrero, L.A., G. Maas and W. Hogland (2013) 'Solid waste management challenges for cities in developing countries', Waste management, 33(1), pp. 220–232, DOI: 10.1016/j.wasman.2012.09.008. Gutiérrez, N.L., R. Hilborn and O. Defeo (2011) 'Leadership, social capital and incentives promote successful fisheries', Nature, 470 (7334), pp. 386–389, DOI: 10.1038/nature09689. Hasirudala (2012) Who are waste pickers and informal waste workers? What do they do?, (Bangalore: Hasiru Dala), http://www.hasirudala.in/​ (accessed on 27 April 2017). India (Government of) (2009) Position Paper on the Solid Waste Management Sector in India (Bangalore: Department of Economic Affairs), http://www.indiaenvironmentportal.org.in/​files/​ppp_position_paper_solid_waste_mgmt.pdf (accessed on 27 April 2017). India (Government of) (2000) The Municipal Solid Wastes (Management and Handling) Rules (New Delhi: Ministry of Environment and Forests), http://www.indiaenvironmentportal.org.in/​content/​257913/​the-municipal-solid-wastes-management-and-handling-rules-2000/​ (accessed on 27 April 2017). Iyer, R. (2012) 'Bangalore Garbage Crisis: Karnataka High Court questions municipal authority', Deccan Herald, 2 November. Joseph, K. (2002) Perspectives of solid waste management in India, paper presented at the International Symposium on Technology and Management of the Treatment and Reuse of the Municipal Solid Waste, Shanghai, http://citeseerx.ist.psu.edu/​viewdoc/​download?doi=10.1.1.493.1311&rep=rep1&type=pdf (accessed on 27 April 2017). Karanth, G K (2017) '"Foodscapes" in Bengaluru - Changing Patterns of Family Eating Out and Waste Generation', International Development Policy, 8.2, DOI : 10.4000/poldev. 2480. Kasturi, P.B. (2012) 'Trash Trail', Daily Dump, 20 (Bangalore), Daily Dump Publications India. Kemp, R. (2000) 'An Example of a “Managed Transition”: The Transformation of the Waste Management Subsystem in the Netherlands (1960-2000)', in Lehmann-Waffenschmidt, M. (ed.) Innovations Towards Sustainability, pp. 87-94, DOI: 10.1007/978-3-7908-1650-1_6. Kemp, R., D. Loorbach and J. Rotmans (2007) 'Transition management as a model for managing processes of co-evolution towards sustainable development', The International Journal of Sustainable Development and World Ecology, 14(1), pp. 78-91, DOI: 10.1080/13504500709469709. Krishna, P. (2015) ‘BBMP blasted for not paying garbage workers,’ The Hindu, 14 February, http://www.thehindu.com/​news/​cities/​bangalore/​bbmp-blasted-for-not-paying-garbage-contractors/​article6893977.ece (accessed on 27 April 2017). Krishnan, S. (2014) 'Here’s How Dry Waste Collection Centers started Functioning in Bengaluru', Citizen Matters, http://bangalore.citizenmatters.in/​blogs/​kasa-conscious/​blog_posts/​dry-waste-collection-centres-functioning-in-bengaluru (accessed on 27 April 2017). Kumar, S., J.K. Bhattacharyya, A.N. Vaidya, T. Chakrabarti, S. Devotta and A.B. Akolkar (2009) 'Assessment of the status of municipal solid waste management in metro cities, state capitals, class I cities, and class II towns in India: an insight', Waste Management, 29(2), pp. 883–895, DOI: 10.1016/j.wasman.2008.04.011. Loorbach, D. (2010) 'Transition management for sustainable development: a prescriptive, complexity‐based governance framework', Governance, 23(1), pp. 161-183, DOI: 10.1111/j.1468-0491.2009.01471.x. Loorbach, D. (2007) Transition management: new mode of governance for sustainable development (Rotterdam: Erasmus Universiteit), https://repub.eur.nl/​pub/​10200/​proefschrift.pdf (accessed on 27 April 2017). Loorbach, D. and J. Rotmans (2006) 'Managing Transitions for Sustainable Development', in Olsthoorn, X. and A. J. Wieczorek (eds.) Understanding Industrial Transformation: Views from Different Disciplines (Dordrecht: Springer), pp. 187-206. Lutringer, C. and S. Randeria (2017) ‘Garbage Is Good to Think With: The Interplay of Civic Activism and Judicial Intervention in Shaping Bangalore’s Solid Waste Management Policies’, International Development Policy, 8.2, DOI : 10.4000/poldev.2486. Madhav, R. (2010) 'Untapped Potential: Securing Livelihoods Dependant on Waste. A Review of Law and Policy in India' (mineo), http://www.swachcoop.com/​pdf/​WPandLaw.pdf (accessed on 27 April 2017). Miller, C.A. (2000) 'The Dynamics of Framing Environmental Values and Policy: Four Models of Societal Processes', Environmental Values, 9(2), pp. 211–233, DOI: 10.3197/096327100129342047. Muller, M. and L. Hoffman (2001) Community Partnerships in Integrated Sustainable Waste Management: tools for decision-makers. Experiences from the Urban Waste Expertise Program (1995-2001) (Gouda: Waste). Muller, M.S. (2002) 'Differing interpretations of community participation in waste management in Bamako and Bangalore: some methodological considerations', Environment and Urbanization, 14(2), pp. 241–258, DOI: 10.1177/095624780201400219. Murthy, K. (2015) 'BBMP blasted for not paying garbage contractors', The Hindu, 14 February, http://www.thehindu.com/​news/​cities/​bangalore/​bbmp-blasted-for-not-paying-garbage-contractors/​article6893977.ece (accessed on 1 November 2015). Nandi, J. (2015) ‘Delhi’s waste-to-energy plants ‘toxic, costly inefficient’, Times of India, 31 March, http://timesofindia.indiatimes.com/​home/​environment/​pollution/​Delhis-waste-to-energy-plants-toxic-costly-inefficient/​articleshow/​46751552.cms (accessed on 1 December 2015). Narayanareddy, R. (2011) Specters of Waste in India’s “Silicon Valley”: The Underside of Bangalore’s Hi-Tech Economy, Doctoral Dissertation (Minneapolis: University of Minnesota). Nisbet, M.C. (2009) 'Communicating Climate Change: Why Frames Matter for Public Engagement', Environment: Science and Policy for Sustainable Development, 51(2), pp. 12–23, DOI: 10.3200/ENVT.51.2.12-23. Rai, A. (2012) 'Bangalore: Global “garbage” city', The Times of India, 30 October, http://blogs.timesofindia.indiatimes.com/​life-notes/​entry/​bangalore-global-garbage-city (accessed on 27 April 2017). Ramachandra, T.V. and S. Bachamanda (2007) 'Environmental audit of Municipal Solid Waste Management', International Journal of Environmental Technology and Management, 7(3/4), pp. 369-391, DOI: 10.1504/IJETM.2007.015152. Rao, S. (2013) 'Mandur may be vulnerable to cancer', The Times of India, 5 March, http://articles.timesofindia.indiatimes.com/​2013-03-05/​bangalore/​37468896_1_mandur-landfill-dioxin-levels-kspcb (accessed on 1 January 2014). Rengarajan, N. (2013) Municipal Solid Waste Management In India: Finding Sustainable Pathways For The City Of Bangalore, Masters Dissertation (Phoenix: Arizona State University). Saldanha, L., K. Mallesh and A. Naik (2012) 'KSPCB Shuts Down Ramky SWM Landfill at Mavallipura, Bangalore', Environmental Support Group, press release, 12 July, http://www.esgindia.org/​campaigns/​press/​kspcb-shuts-down-ramkys-swm-landfill-mav.html (accessed on 27 April 2017). Sarkar, P. (2003) 'Solid waste management in Delhi–a social vulnerability study', in Bunch, M.J., V. Madha Suresh and T. Vasantha Kumaran (eds.) Proceedings of the Third International Conference on Environment and Health, Chennai, 15-17 December (Chennai: Department of Geography, University of Madras and Faculty of Environmental Studies, York University), pp. 451–464, http://www.seas.columbia.edu/​earth/​wtert/​sofos/​Sarkar_SWM in Delhi - A Social Vulnerability Study.pdf (accessed on 27 April 2017). Scheinberg, A. (2012) Informal sector integration and high performance recycling: evidence from 20 cities, WIEGO Working Paper (Urban Policies) 23, http://www.wiego.org/​sites/​default/​files/​publications/​files/​Scheinberg_WIEGO_WP23.pdf (accessed on 27 April 2017). Scheinberg, A. (2008) Closing the Circle - Bringing Integrated Sustainable Waste Management Home (The Hague: VNG International). Scheinberg, A., M. Simpson, Y. Gupt, J. Anschütz, I. Haenen and E. Tasheva (2010) Economic aspects of the informal sector in solid waste management, Research Report Volume 1 (Eschborn: GTZ). Scheinberg, A., D. Wilson and L. Rodic (2010) Solid Waste Management in the World’s Cities (London: UN-Habitat, Earthscan), https://thecitywasteproject.files.wordpress.com/​2013/​03/​solid_waste_management_in_the_worlds-cities.pdf (accessed on 27 April 2017). Shankar, C. (2012) 'Where is city’s garbage going? ', Citizen Matters, 7 September, http://bangalore.citizenmatters.in/​articles/​4494-where-is-bengalurus-garbage-goin---garbage-mess (accessed on 1 October 2015). Sharholy, M., K. Ahmad, G. Mahmood and R.C. Trivedi (2008) 'Municipal solid waste management in Indian cities - A review', Waste Management, 28(2), pp. 459–467, DOI: 10.1016/j.wasman.2007.02.008. Sudhir, V., G. Srinivasan and V.R. Muraleedharan (1997) 'Planning for sustainable solid waste management in urban India', System Dynamics Review, 13(3), pp. 223–246, DOI: 10.1002/(SICI)1099-1727(199723)13:3<223::AID-SDR127>3.0.CO;2-Q. SWMRT (Solid Waste Management Round Table) (2009) Website of the Round Table, http://swmrt.com/​ (accessed on 1 November 2015). The Hindu (2012) 'Segregate garbage from October 1st or else', 13 September, http://www.thehindu.com/​news/​cities/​bangalore/​article3889914.ece (accessed on 1 January 2013). Visvanathan, C. and J. Tränkler (2003) Municipal solid waste management in Asia: A comparative analysis, Workshop on Sustainable Landfill Management, 3–5 December, Chennai. Voß, J.P. and B. Bornemann (2011) 'The politics of reflexive governance: challenges for designing adaptive management and transition management', Ecology and Society, 16(2), http://www.ecologyandsociety.org/​vol16/​iss2/​art9/​ (accessed on 27 April 2017). White, D.D. (2013) 'Framing Water Sustainability in an Environmental Decision Support System', Society & Natural Resources, 26(11), pp. 1365-1373, DOI: 10.1080/08941920.2013.788401. White, D.D., E.A. Corley and M.S. White (2008) 'Water managers' perceptions of the science–policy interface in Phoenix, Arizona: Implications for an emerging boundary organization', Society and Natural Resources, 21(3), pp. 230-243, DOI: 10.1080/08941920701329678. White, D.D. and T.E. Hall (2006) 'Public understanding of science in Pacific Northwest salmon recovery policy', Society and Natural Resources, 19(4), pp. 305-320, DOI: 10.1080/08941920500519172. Wiek, A., L. Withycombe, C. Redman and S. Mills (2011) 'Moving forward on competence in sustainability research and problem solving', Environment Magazine, 53(2), http://www.environmentmagazine.org/​Archives/​Back%20Issues/​2011/​March-April%202011/​moving-forward-full.html (accessed on 27 April 2017). Zurbrügg, C., S. Drescher, A. Patel and H.C. Sharatchandra (2004) 'Decentralised composting of urban waste–an overview of community and private initiatives in Indian cities', Waste Management, 24(7), pp. 655–662, DOI: 10.1016/j.wasman.2004.01.003. 1 We reviewed the following sources to obtain information on the list of actors and stakeholders in Bangalore’s SWM system and their socio-economic statuses, skills and roles within the SWM system: Ahmed and Ali (2004); Anantharaman (2014); Baud et al. (2004); Baud and Post (2003); Boyer and Cook (2010); Cavé (2014); Madhav (2010); Muller and Hoffman (2001); Muller (2002); Sarkar (2003); Scheinberg (2012); Sharholy et al. (2008); Sudhir et al. (1997); Visvanathan and Tränkler (2003); Gerdes and Gunsilius (2010); Scheinberg, Wilson, and Rodic (2010); and Scheinberg (2008). 2 Official BBMP estimates of the quantity of municipal solid waste (MSW) produced in Bangalore placed the number at around 3,000 tons/day in 2009, of which 53 per cent was organic, ‘green’ waste, 12 per cent plastic, and 9 per cent paper, with the remaining being made up of inert, biomedical, and other wastes (http://218.248.45.169/download/health/swm.pdf, accessed on 27 April 2017). The Central Pollution Control Board (CPCB, 2012; 2013) estimated Bangalore’s daily waste production to be 3,700 tons in 2010‒11. 4 The MSW Rules 2000 seek to minimise landfilling by adherence to the following practices (Esakku et al., 2007): mandatory at-source segregation, door-to-door collection, abolition of open storage, abolition of littering and the open burning of waste, daily sweeping of streets, transport of waste in covered vehicles, waste processing by composting or energy recovery, and only inert waste and incineration residues can be placed in a landfill. 5 The Dutch saw an elevenfold landfill decrease (14 Megaton to 5 Megaton) from 1977 to 2000, with recycling doubling in the same period (Kemp, 2000). An environmental engineer by training, Nivedita Biyani (née Rengarajan) is currently a PhD student at Arizona State University, where she has conducted research into effective public–private partnerships in waste management and recycling in Bangalore (India), Vienna (Austria) and Phoenix (USA). She has worked on the waste/sustainability interface in various countries, including Austria, India, the USA and Singapore. Manisha Anantharaman is a tenure track Assistant Professor at Saint Mary's College of California in the Bay Area. Her research and teaching interests straddle the interconnected spheres of sustainability and social justice, applying participatory and ethnographic methodologies. She received her PhD from the University of California Berkeley (2015).